NC film incentives: 19 cents on the dollar? A presentation prepared by the Labor and Economic Analysis Division (LEAD) of the North Carolina Department of Commerce finds a net “negative budgetary impact” of North Carolina’s film incentives. 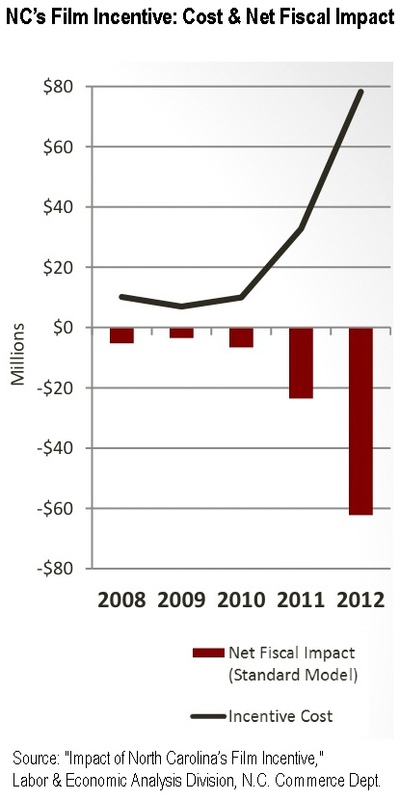 In 2012, according to the presentation, $76.9 million in film credits were claimed, with a net fiscal cost of $62.0 million. That would amount to about 19.4 cents returned to state revenues for every dollar spent. On the right is a chart from the presentation. The methodology used in the analysis is still unclear. I phoned the Commerce Dept. last week with questions but, as of this writing, haven’t heard back. 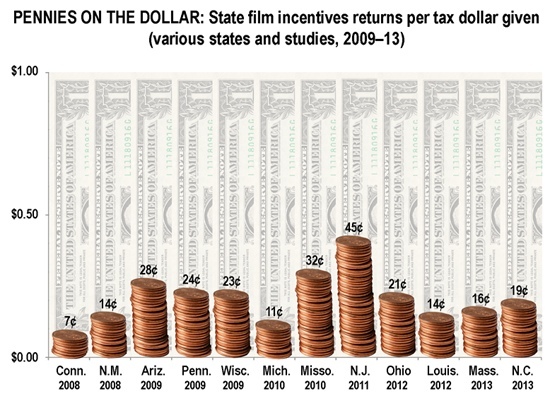 Nevertheless, a finding of 19 cents returned to the state for every dollar spent on film incentives would be in line with the findings of many other studies conducted for various state agencies or legislatures of their film incentives programs. Note: studies referenced in the chart above were prepared for, sequentially: Connecticut Dept. of Community and Economic Development, New Mexico Legislative Finance Committee, Arizona Dept. of Commerce and Motion Picture Association of America, Pennsylvania Legislature, Wisconsin Dept. of Commerce, Michigan Legislature, Missouri Tax Credit Review Commission, New Jersey Economic Development Authority, Greater Cleveland Film Commission, Louisiana Budget Commission, Massachusetts Dept. of Revenue, and North Carolina Dept. of Commerce.